AFC Bournemouth remain top of Premier League Cup Group C, but were defeated for the first time in the competition this season 4-2 away to Burnley. Shaun Cooper's men can still qualify for the last-16 in their final two games against Liverpool and West Bromwich Albion, but were made to rue missed chances against the Clarets. The Cherries started the first-half on top, making the most of the ball in wide areas with Frank Vincent and Charlie Seaman flying forward from full-back. But against the run of play, the visitors were 1-0 down after Marley Blair nicked the ball high up the pitch and drove into the area before finding a finish into the corner. At the other end though, Corey Jordan almost levelled from Vincent's teasing delivery, forcing a good save from England international Nick Pope. And Pope had to be on hand to prove his international pedigree when Kyle Taylor hit a majestic volley that was flying into the corner, but for Pope's brilliant outstretched hand. At the other end though, Tom Parker-Trott was called into action himself, making a superb one handed stop to deny Rob Harker. The second-half saw Cooper's side come out on the front foot, and they made their constant possession count 13 minutes into the second period. Taylor looped in an excellent high corner to the back-post where Jordan had drifted to, and he headed in superbly to level the scores. And two minutes after the defender's brilliant header, the Cherries had turned the game around. 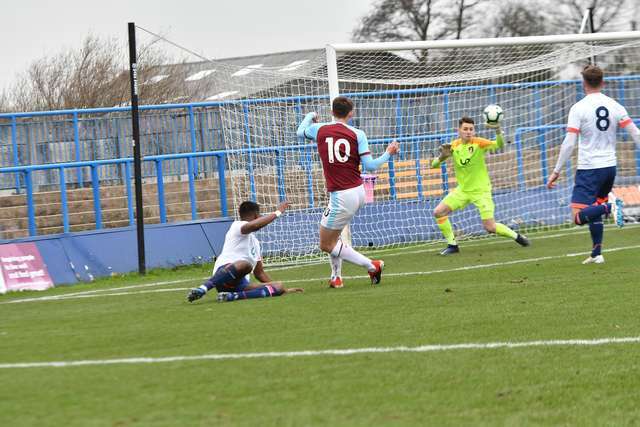 Some lovely build up play resulted in Vincent collecting the ball in the box and hammering a venomous drive goalwards, only for Clarets' skipper Anthony Glennon to divert the ball into his own net. It was nothing more than the Cherries deserved for their efforts, but Burnley were level four minutes later. After Dinesh Gillela was clattered on the touchline, no foul was given and Burnley were able to break. Blair scored his second of the game an emphatic finish right into the top corner. That swung the momentum of the game and Harker, after being denied superbly by Parker-Trott in the first-half, was able to dispatch an effort into the top corner to make it 3-2 with 15 minutes left to play. The hosts then put their height and direct play to good use to make it 4-2, with Bobby Thomas heading in from a corner. The Cherries still showed plenty of fight and on another day, would have made it a nervy finale. With four minutes to go and after a succession of corners, Pope saved well from a scramble in the box, Jordan Cropper cleared an effort off the line before Jake Scrimshaw - who scored a hat-trick for the under-18s on Wednesday - somehow was denied after he smashed a volley from point blank range. That was the last action as the under-21s still have qualification in their sights, with an away game against West Bromwich Albion to come next month which could see the side confirm top spot in Group C.